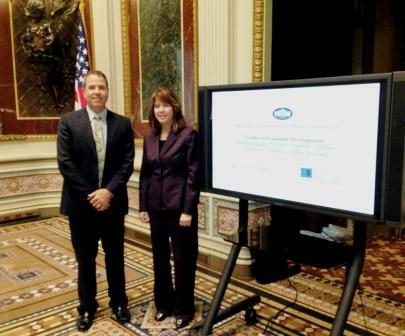 Midland Tomorrow Chief Executive Officer Scott Walker and Saginaw Future Inc. President JoAnn Crary joined approximately 50 economic development professionals from across the country at a White House forum on economic development today. This is the second year the International Economic Development Council(IEDC), SelectUSA and other partners have hosted the forum at the White House. Key topics were discussed that have the greatest potential to positively impact job creation in the near- and long-term. The event featured substantive dialogue and exchanges of ideas between attendees and the most senior decisions makers involved in federal economic development programming and policies from several federal agencies, including the White House Business Council. Crary spoke at a session titled ‘Facilitating Investment and Promoting Economic Growth in the US’. “This was a tremendous opportunity to interact with the recently appointed Commerce Secretary Pritzker, Select USA Director Thummalapally and other federal leaders impacting economic development,” Crary stated. “We look forward to our collaborative efforts to attract jobs and investment to the Great Lakes Bay Region."